The production ready DB2 was first shown during April 1950 at the New York Motor Show, a fitting event as in order to get scarce steel, British motor manufacturers needed to export as many cars as possible. Demand for the modern looking car was incredibly strong yet the factory were not able to build cars fast enough. 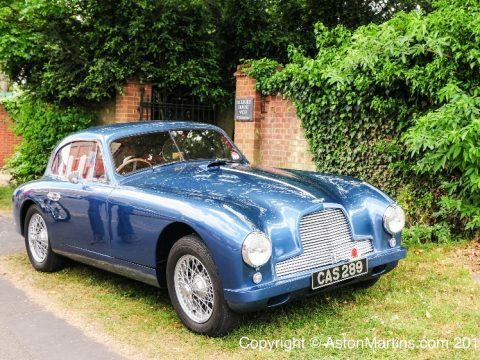 The success of the team cars during the 1950 Le Mans 24 hour race (examples hastily snatched from the production line) made the DB2 an even more attractive car to the affluent post-war sporting motorist. The earliest cars (the first 49) feature a three part grille similar to that of the DB1, a large rectangular side vent behind each front wheel and bright trim along the side beneath the door. These triple grille cars are occasionally known as ‘washboards’ on account of the distinctive side vents. An excellent photographic resource on the ‘Washboard’ cars can be found on the Astonuts website. From the 50th car, the side vent was deleted and three part grille was replaced by a simpler arraignment of horizontal bars, a design which lasted in production through to the DB2/4 Mark 2 in 1957. The rear ‘boot’ lid is really for entry to the spare wheel. Since the DB2 is strictly a two seater, there’s plenty of space for luggage behind the seats. This particular car has the addition of indicators which were not available from the factory when the car was new. This (pictured above) DB2 was privately entered at Le Mans, finishing well in both 1951 and 1952. And the car is still racing today as I pictured this in the paddock at Donnington Park at the AMOC race meeting in 1997 and racing in 1999. Low weight together with an six cylinder , twin overhead cam engine of 2,580 cc initially producing 105 bhp, made the DB2 a very quick car for the time. Motor tested the DB2 to a maximum of 110 mph, with a 0-60 time of 12.4 seconds. The compression ratio appears especially low at 6.5 to 1 but this was necessary as at the time due to the low octane post-war pool petrol. From January 1951, an optional 125bhp Vantage VB6E/ engine with bigger carburettors and a 8.2 to 1 compression ratio made the DB2 even quicker. At this time, the ‘Vantage’ option represented a more powerful engine but no other performance or styling modifications. Access to the engine is easy with the massive front hinged single piece bonnet. This (pictured above) famous car belongs to long time Aston Martin owner Tom May. On his 79th birthday in 1995 (his 80th year), Tom drove his DB2 around the banked circuit at Millbrook at an average speed of 80mph for 80 minutes. This remarkable record is thus just known as the 80-80-80. At one time the DB2 and driver reached 114 mph with a lap at an average of 108.5mph. During a production run of three years a total of 411 DB2’s were built including 102 examples of an attractive drophead coupe. It was replaced by the 2+2 DB2/4 complete with the 2.6 litre VB6E/ ‘Vantage’ engine as standard in 1953.